The story of Nat Turner, the slave and preacher who led a failed 1831 rebellion, is surrounded by mystery and speculation as to his motives and the role that faith played in the uprising. Nate Parker, the controversial director, star and writer of “The Birth of a Nation,” a movie about Turner that is set to be released on Friday (Oct. 7), noted that his version is “based on a true story” rather than a historic retelling. What is known is that Turner led a rebellion in Southampton County, Va., on Aug. 21, 1831, with dozens of slaves joining him in killing at least 55 whites over a two-day period. In the aftermath, an estimated 200 blacks, some free and some enslaved, were executed. 1. He learned to read and write at an early age. “By and large, it was very rare for enslaved people to be able to read,” said James Dator, an assistant professor of history at Goucher College in Maryland. 2. He thought the world as he knew it was about to end. Lampley differed with Thomas Gray, the white interviewer/author of “The Confessions of Nat Turner,” who declared the rebel could be a “complete fanatic.” The Santa Clara University lecturer instead views Turner as a man motivated by apocalyptic theology. Lampley said Turner integrated his visions with his belief in the Trinity. 3. He baptized a white man. Lampley considers this cross-racial baptism to be a sign of the sincerity of Turner’s faith. 4. He is linked to black spirituals. No other single individual has been given credit for composing a spiritual, she said. “Steal Away” includes the repeated phrase “I ain’t got long to stay here,” which Guenther said reflects the tradition of spirituals to have one meaning to slaveholders and another to slaves. 5. His Bible was preserved. Turner’s well-worn, coverless spiritual guide is on display in the Smithsonian’s National Museum of African American History and Culture. “It was his deep faith that allowed him to do what he did,” said Rex Ellis, the museum’s associate director for curatorial affairs. The exhibit also contains a brick from the Whitehead plantation where Turner killed Margaret Whitehead during his rebellion. 6. His rebellion led to strictures against black Christianity. Lampley said laws were enacted in Virginia after the rebellion that prevented blacks from gathering or having their own preachers. “There had to be whites present at any time there was any kind of gathering,” he said. Dator, a scholar of slavery and slave resistance, said those kinds of strictures occurred throughout the South after Turner’s actions. 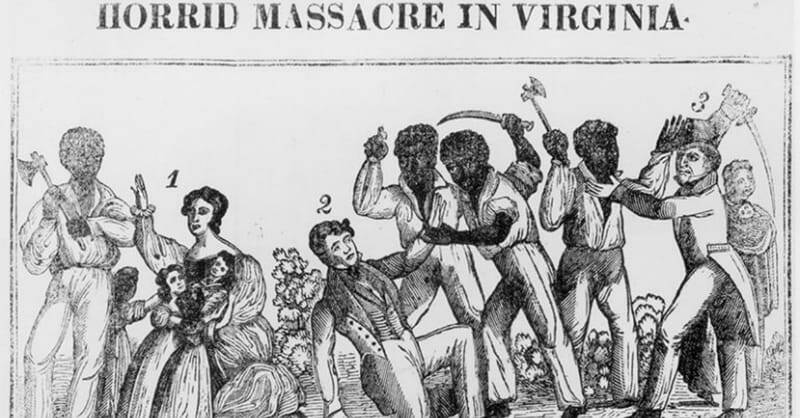 Photo: A wood engraving depicts the “Horrid Massacre in Virginia” during Nat Turner’s Rebellion, circa 1831.